A special dinner with your main squeeze doesn’t need to be complicated or expensive. Consider these romantic dinner ideas you can cook at home. Whether you are dining out on Valentine’s Day or another special occasion, a romantic dinner can often be a crowded, frustrating, and overpriced experience. 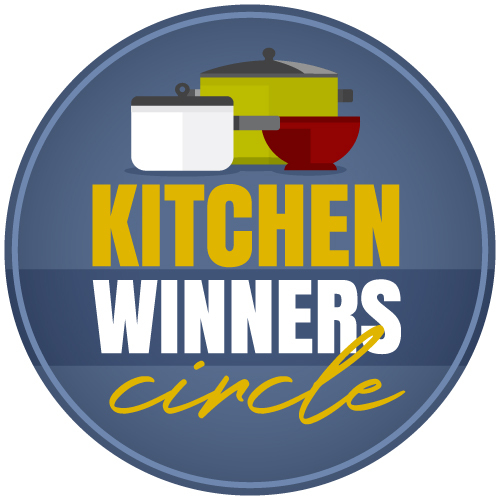 Avoid the restaurant scene and enjoy a delicious dinner in the comfort of your own home. Your meal doesn’t have to be complicated to be delicious. 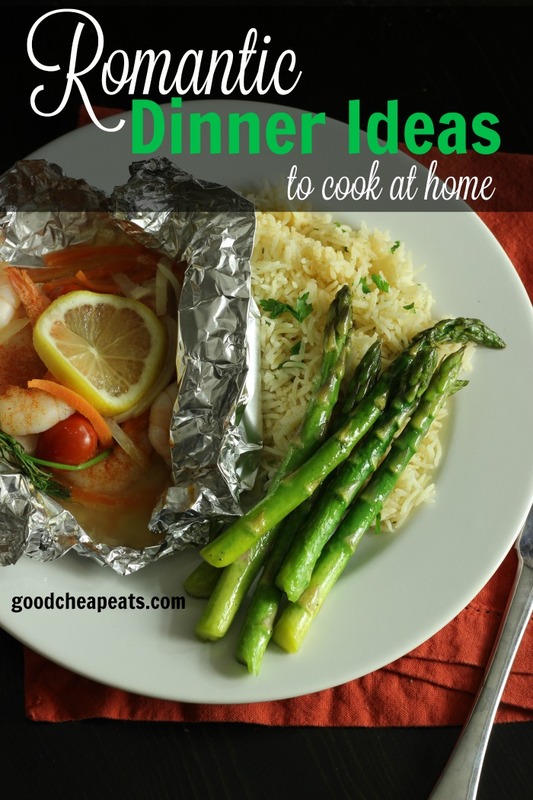 Below you’ll find several romantic dinner ideas that you can cook at home. 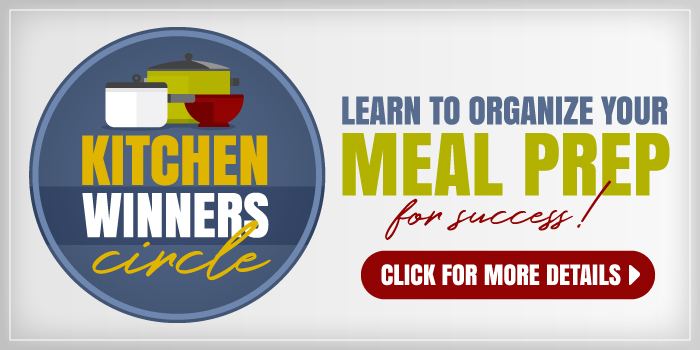 Each has an easy preparation and in some instances can be made ahead of time. Whichever you choose, it will be yummy. The time you save can be spent on more important things. If you’re looking for an easy, make-ahead meal that will impress, try Favorite Slow Cooker Pot Roast. Spend about 15 minutes prepping it in the morning and let the slow cooker do its work for six hours. The slow braise allows the flavors to develop, making this one of my favorite recipes. Serve the meat with the jus over mashed potatoes and vegetables. 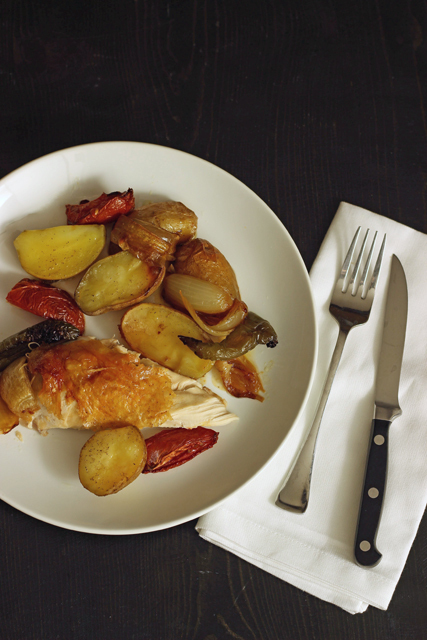 Roast Chicken and Vegetables is an ideal dish for Valentine’s Day. It takes very little time to prepare so you can spend more time with your Valentine. You DO have to start early because it takes about 2 1/2 hours to cook, but it’s totally worth it. The resulting crispy skin, tender meat, and succulent vegetables are delicious. 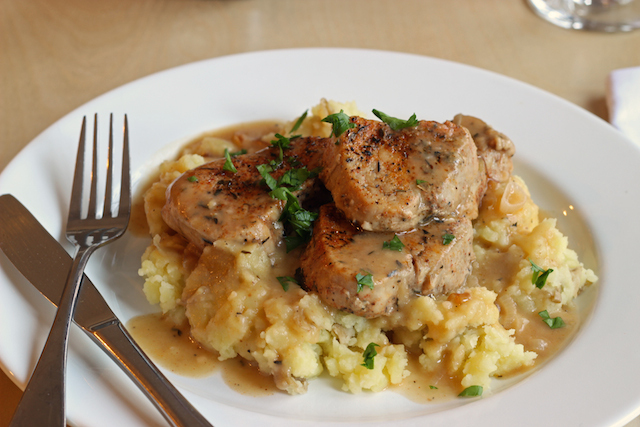 You’ll feel like a rockstar chef when you serve up this amazing meal: slices of pork tenderloin bathed in a sherry and shallot sauce atop mashed potatoes. It tastes like a million bucks, but it won’t cost you more than ten. When we visited France, we enjoyed a version of these Easy Shrimp and Fish Packets. They’re simple yet so delicious! 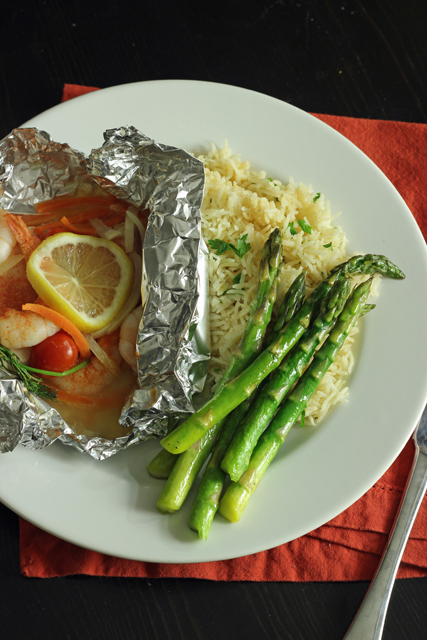 Just wrap chunks of fish and whole shrimp in foil with vegetables, herbs, and butter for a simple and succulent supper. Slide in a dish of Baked Rice to cook alongside it and you’ve got a complete meal. Chicken Parmesan holds a special place in my heart. It was the very first meal that I cooked for FishPapa. In past years, we’ve recreated that meal in celebration of Valentine’s Day. 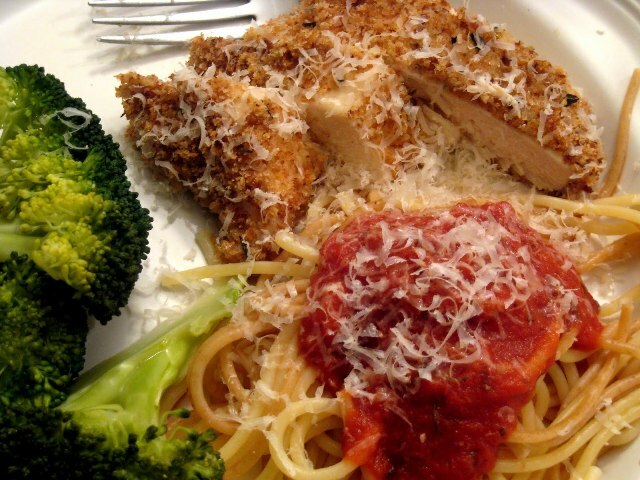 We like to serve the chicken with pasta, red sauce, steamed veggies and homemade garlic bread. What’s your favorite recipe for an at-home date night? Steak with a pan sauce is my husband’s favorite, but we both love rack of lamb plus asparagus roasted in the rendered lamb fat left in the pan for super fancy days. Yum, those all look great! I’m a fish fan 🙂 I’ve discovered wild caught cod it’s amazing and its fresh! I made it with halved Brussel sprouts sauted in oil or butter with scallions add a chopped sweet potatoe after I softened it in the microwave browned it all removed it cooked fish in that pot then put everything back in and added 1-2 cups of coconut milk salt & pep. The taste was amazing I can’t wait to make it again. Try it! It’s worth it! Oh Stephanie – that sounds so nice. My hubs and I like to stay in as well. I find that the times we have ventured out, it just hasn’t been a great experience. I’m still trying to decide what I want to do. As homey as it sounds, my husband would be so happy with just meatloaf and mashed potatoes! I, on the other hand would prefer some seafood or steak. I may do scallops since he does like those alot. Hi Melissa: You probably have some wonderful recipes for scallops. We love them too. 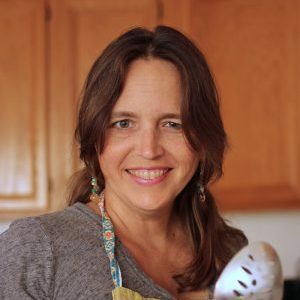 I thought I would share a couple of recipes that we love. One is for scallops or you can use large shrimp and the other is a crab and shrimp dish that I made on Valentines Day last year. Combine all ingredients in a small sauce pan. Bring to a simmer while stirring for 8 – 10 minutes, allowing alcohol to cook down. Cool and set aside. Wrap a half a piece of bacon around each scallop and place four or so on a skewer. Repeat with remaining skewers. Brush scallops with olive oil and season with salt and pepper. Place scallops on a medium/hot grill. Keep an eye on them because they will cook quickly and you don’t want to burn them. Grill for about 2 – 3 minutes per side. Take them off the grill when they are about 80% done. Add the peach bourbon BBQ sauce during the last moments of cooking or when the cooking is complete for added flavor. These also make great appetizers if you’re having a party. Brown garlic; add tomatoes and peppers and sautee a few minutes. Add crabmeat, shrimp, parsley, and spices. Simmer approximately 10 minutes. Also here is a very quick and easy dessert idea that I served last year as well. 1 package of Dr. Oetker chocolate mousse (brown box located in the pudding/jello aisle. The morning of prepare the mousse and spoon over the jello. When ready to serve, put a dollop of cream on top and garnish with chocolate shavings. Thanks Stephanie – sounds devine! And we like the chocolate mousse too! Thanks, Jessica. I’m not sure if you are seafood eaters but I bet you would all love the dessert. At Halloween time, you can make orange jello and lime at St. Patrick’s Day. We’ve only gone out for Vday one year in our marriage. We happened to have a free babysitter and there had been a blizzard the day before so NO ONE was at Cheesecake Factory when we went. It was great. We had the place to ourselves. Crazy, but fun. We had this very discussion last night. I’m having hubby grill steaks on the barbecue. Then I’ll do the side dishes and dessert in the kitchen. I’m keeping it simple this year. Organic sweet potatoes and asparagus for sides. Chocolate lava cakes with a peanut butter inside for dessert. That way minimal kitchen mess to clean up. I want to know more about the chocolate lava cakes. Oh these are SO good! Easy to put together from basic items found in the pantry. Warm and fudgy chocolate cakes with melted peanut butter inside. These cakes are not overly sweet but have a rich, intense chocolate flavor. Spray each ramekin with nonstick cooking spray and dust with cocoa powder. This ensures the cakes will seamlessly come out of the ramekins when inverted onto a plate. Spoon chocolate batter evenly into each prepared ramekin. Top with peanut butter and use a spoon to slightly press it down into the batter. Some may still be exposed but don’t sweat it. Place ramekins onto a baking sheet and bake for 12-13 minutes until the sides appear solid and firm. The top may still look slightly soft. Allow to cool for 1 minute, then cover each with an inverted plate and turn over. Use an oven mitt because those ramekins are hot! The cakes should release easily from the ramekin. Top with ice cream and melted peanut butter and/or chocolate syrup for serving, if desired. Serve immediately. Sounds amazing. I’d have to use almond or sunflower butter instead, but sounds really yummy. Thanks!